I love the Sticky Institute. If nothing else I love it for the typewriters it has within its little shop. I visit whenever I can but that’s only when I manage a trip to the CBD while they’re open. Every time I’m there I take a photo and buy a zine or two. Some of the zines I’ve bought have been really tiny and would easy fit into one of my medical tablets I take every day. Actually, I only lie a little, they’re about double that size but they’re still gorgeous and the money mostly goes to the author with only a modest percentage going to the Sticky Institute to help fund the shop and their activities. 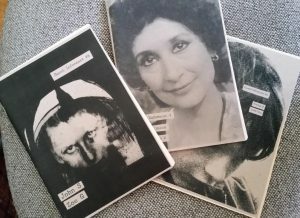 I was there a few weeks ago and bought these three zines. They are numbers 1, 6 and 7 in the series. Next time I’m there I’ll be buying more. They were only $3 each but well worth it. What you’ve got in each of these is a conversation between two people. It’s a normal conversation so you get all the pauses, repeated words and other normal conversation tics. Some of the people are more fluent with their words than others, just like sometimes my typing is more fluent than others. This is far more natural than conversations you get in books. Why? Because conversations in books are constructed to show you exactly what you need for the plot and to give the reader pointers to their character. Each word is chosen carefully to ensure the reader gets the information they need at the right time. In books the conversation is carefully broken up with descriptions of what else is happening and you’re unlikely to get more than a couple of pages of conversation. In these zines you get about 30 pages of just conversation. It feels like I’m sitting there listening to them talk. I’m glad you asked. They sit down with some sort of recording device and just talk. When they’ve finished one of them then gets the fun job of transcribing the entire recording. I’m guessing this can take a while. It can take between four and eight minutes to transcribe just one minute of recording. I’m in awe of their dedication.